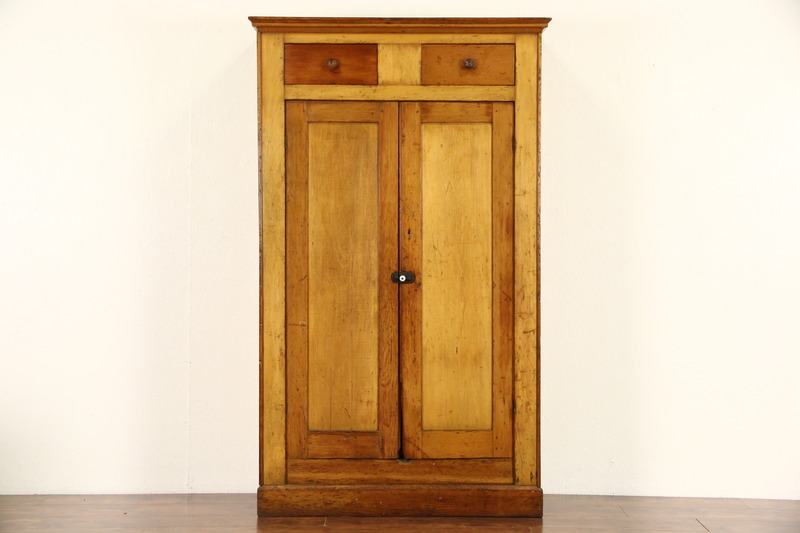 A country pine jelly or pantry cupboard was hand made about 1860. The old finish is in very fine condition, waxed and buffed - all that is needed to maintain the warm antique patina is an occasional wipe with a soft dry cloth. Square cut nail heads are visible everywhere on this American made furniture. Original drawer knobs are attached with wooden screws, the iron door latch appears original as well. Doors have reverse chamfered panels and joints with carved wooden pegs. The lock has no key, but originally secured a year long supply of home made jams and jellies. Measurements are 41" wide, 18" deep and 68 1/2" tall.